Running a small business can be exciting, especially when it starts to take off. You feel that all of that hard work is finally paying off. 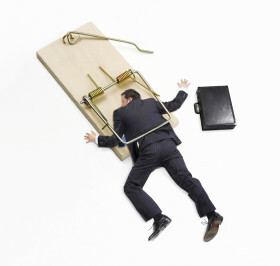 However, despite this initial wave of success some small businesses continue to make fatal mistakes. Here is a list of 10. 1. Failing to expand your marketing. You may have been able to reach a significant number of people up to this point, but if you want your business to grow it’s essential that you continually find new ways to market. Utilize tools like social media to spread the word and generate feedback. 2. Expanding too fast. Be realistic about how fast you can grow. Restaurants often expand too fast and realize that they are starting to lose money. Don’t get too caught up in the emotional excitement of expansion. Have clearly defined goals and be conservative. 3. Forgetting about customer service. It may not matter how good your product is if you don’t treat your customers with respect. Make sure they are satisfied and they will reward you by telling their friends about how good of a company you are. 4. Picking a bad name. If your company is still being developed make sure you have a good name. As silly as it sounds, a bad name or logo can really affect the success of the company. Don’t make it too hard to spell or pronounce. 5. Stop seeking customer feedback. Just because you feel good about a product, it doesn’t mean you are done. The most successful companies are constantly changing their product to fit the changing needs of their customers. Listen to their concerns and be willing to adapt accordingly. 6. Wasting money on brochures and business cards. While these make you feel more like a professional, don’t spend money on them just because they make you feel official. Money can be tight in a small business so make sure you use it smartly. 7. Spending too much on a website. Before you buy a domain name and pay someone to develop a website, establish a marketing plan. Use free tools like social media or blogging. Ask yourself, will my customers really visit this website and is it worth the cost? You may want to put it off for a little while. 8. Ignoring competition. Your success as a company largely depends on your ability to define yourself in relation to competing companies. What makes you stand out? Are there any new companies that may challenge you? In short, be aware of your surroundings. 9. Trying to do everything on your own. If you are running a small business it is essential that you learn to delegate and ask for help. You simply cannot do everything on your own. Surround yourself with people who know what they are doing. 10. Giving up. Just because something doesn’t work, it doesn’t mean your company is doomed to fail. Find ways to adapt. Go back to your original goals and re-evaluate. Very few people succeed on their first try. About the Author: Robert Cordray is a freelance writer and expert in business and finances. He has received many accolades for his work in teaching and business consultation. He is currently an active small business news contributor. Previous article: The Facebook Surprise – Promotional Cover Images Now Allowed? I’ve been self employed for about 22 years ….. and I cant fault any of those. It’s a great article. I’d like to share it here http://www.sunzu.com/articles if you are ok with that and I will of course link back. Hi Angus, thanks for your kind words. I have an agreement with the author to keep the content uniquely on this blog, so you can’t republish it. Just took a look at your site, looks great! Great article Robert, especially no. 10. I would add some more points some are extensions of what you have written. Don’t believe the hype, carry out the market research and due diligence to ensure, as best you can, that there is a market for your product/service. Ensure that you have enough cash to get to where you need to be. Work on the basis that, whatever projections you have made, it will take twice as long and cost three times as much as you had planned. Make sure that you have worked through the “what ifs”, we plan with optimism but life has a habit of not working like that. I agree with most of your points, but I wonder about the business card caution. For less than $50 these days, they are great to be able to pass around at a networking event or when you call on a customer.